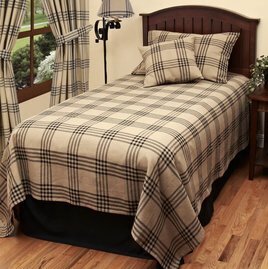 The Chesterfield Check Bedding Collection is available in two colors, Black/Oat & Barn Red/Oat, and two sizes, twin & queen. This listing is for the bedcover only. To see all the coordinating Chesterfield Check accessories see link below. The Black Smithfield Jacquard Queen Bed Cover brings a classic touch to your country home! Made of cotton this bed cover will coordinate with other pieces of the Smithfield Jacquard Collection. In-stock and ready to ship. 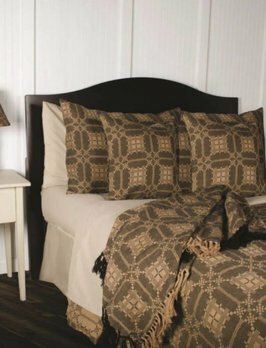 The Black Smithfield Jacquard King Bed Cover brings a classic touch to your country home! Made of cotton this bed cover will coordinate with other pieces of the Smithfield Jacquard Collection. In-stock and ready to ship. Bring classic farmhouse style to your country bath with the Fieldstone Plaid Black Shower Curtain. 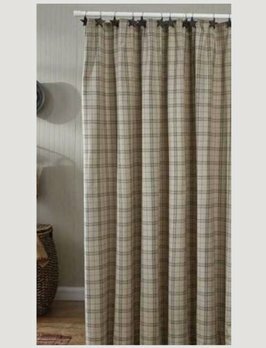 This shower curtain blends the colors of Oatmeal & Black Plaid. Dry cleaning is recommended to preserve color and to prevent shrinkage. The Red Nutmeg Smithfield Jacquard Queen Bed Cover brings a classic touch to your country home! Made of cotton this bed cover will coordinate with other pieces of the Smithfield Jacquard Collection. In-stock and ready to ship. Nothing says primitive country like the Farmhouse Star Standard Sham. 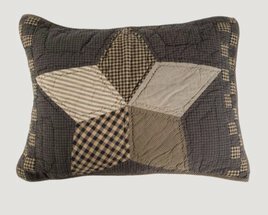 It has large 5-point patchwork star centered on black & tan check fabric bordered with patchwork blocks. Reverses to charcoal on dark creme ticking stripe fabric. 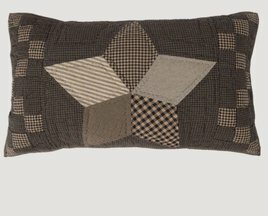 The Farmhouse Star Luxury Sham features black, brown, cream and ivory fabrics in an eye-catching pattern of hand-stitched patchwork stars. Classic design with quality workmanship are sure to provide years of stylish service from this ensemble.